Everyone has a crochet personality. Let’s find out which one you are! Below are 3 fun personalities that I thought of. If you don’t fit any, feel free to make up your own and tell me about it! Loves crocheting blankets, doilies, hats or scarves. 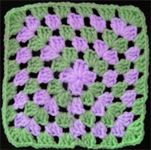 Never gets tired of a good old granny square. Is always learning new techniques. Crochets a variety of items: bags, clothing, home decor, etc. May get bored crocheting the same thing all the time. 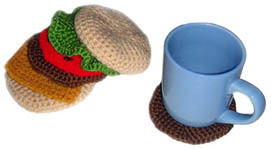 Loves making thing that are “out of the ordinary” like a Crochet Hamburger Coaster Set. Doesn’t always follow patterns, just because you like to be different. Personally, I think I’m a “Novelty Nut”. Although I do enjoy the classics, I have the most fun creating weird, novelty items. What’s your crochet personality? This entry was posted on Monday, November 16th, 2009 at 8:14 AM by Rachel Choi	and is filed under Fun Ramblings. You can follow any responses to this entry through the RSS 2.0 feed. You can leave a response, or trackback from your own site. I tend to do projects that I will use instead of buying the store alternative… Hats, scarves, socks, etc. Or, I do them as gifts for family and friends. If I start a project without knowing who or what it’s for, I feel it’ll just end up at the back of a closet! I would have to add yet another category – eclectic scatalogical crocheter. I am a combination of the categories Rachel has listed plus Andy’s category…LOL! It depends on my mood and what I feel like working on as well as interesting and cool patterns I see. I’m probably a combination of the ‘classic’ and the ‘modern’ depending on my mood. Sometimes I just want to relax and do something easy and that doesn’t require major concentration of an intricate pattern. Other times I DO like to challenge myself and make something ‘pretty’, but from a pattern that requires some focusing, counting, concentration, and ‘logging’ of rows. A little off topic, Rachel, I started the piano scarf last night, but got stuck after the first row of slip stiches. Following the slip stitch row, do I sc in BOTH loops of the slip stitches? When I did it that way, the black line got covered in white. Please help!!! I really want to make it for my nephew who fell in love with the piano when he was about 3 years old (he’s an adult now). Thank you in advance, and thank you for this great site! Paulette, the piano scarf is done in the front loops only. Let me know if you need more help. So just to be sure, the ‘front loop only’ applies just to the single crochets into the slip stitches, but all other rows are done through both loops, yes? All the rows and stitches are done in front loop only. But if you started in both loops already, it shouldn’t make much of a difference, other than the stitches you make into the slip stitches. I am a modern, classic,novel crocheter! I like to try anything and everything and do! Ahhh! That explains it. ALL rows and stitches. I must have missed that in the pattern directions as well as in the comments. The front loop of the starting chain too? I actually did the stitches into the starting chain as you would normally do it, not in the front loop. But if you want to make it even nicer, you can do your stitches into the back ridge of the chain to give it a more uniform edge. I am a true modern madam with a pinch of novelty. The mere thought of crocheting an afghan or scarf bores me to tears. I try to stay away from projects that have many repetitions or long rows. I am not too fond of monotony. Sometimes, I think of starting new projects in the middle of working on a current project.. I hope to start anew tonight. I didn’t really go beyond the slip stitch row for the reason I mentioned, so nothing lost really. I am all 3 i guess. I mostly use thread instead of yarn. my mother-in-law was crocheting with thread so thats when i started. Hi Rachel, I am a modern madam. I do get bored if a project is too big. I prefer small projects that get done and then on to a new one. Thanks for all your patterns and for all the help also. 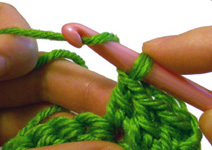 I am definitely lean toward the Classic crocheter. The simpler the better. Even though I know all the crochet stitches I love doing a simple single crochet blanket. Blankets are my passion and I do like making them for those in need. In fact, I use to have a blanket ministry at church until I got too sick to maintain it. Now that I’m getting better I am going to start donating again. However, occasionally I like making different things like those nylon scrubbies. I usually stick with simple things that people can get the most use out of.